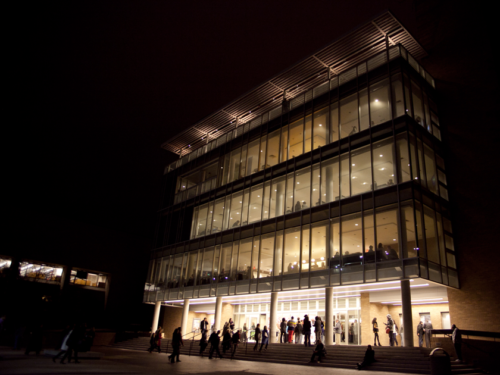 Completed in 1981 on the University of Texas at Austin campus, this flagship theatre of Texas Performing Arts is the largest in Austin, with seating for 2,900. The Nancy Lee and Perry R. Bass Concert Hall boasts a vast stage, an orchestra pit capable of holding 100 musicians, dressing rooms to accommodate more than 100 performers, computerized lighting, advanced sound and rigging systems, and a mammoth backstage area complete with workshops for carpentry, costumes, painting, metalwork and props. Ranking among the finest performance spaces in the country both in size and accouterments, it is no wonder that Bass Concert Hall attracts the world’s greatest performers and full-scale productions. 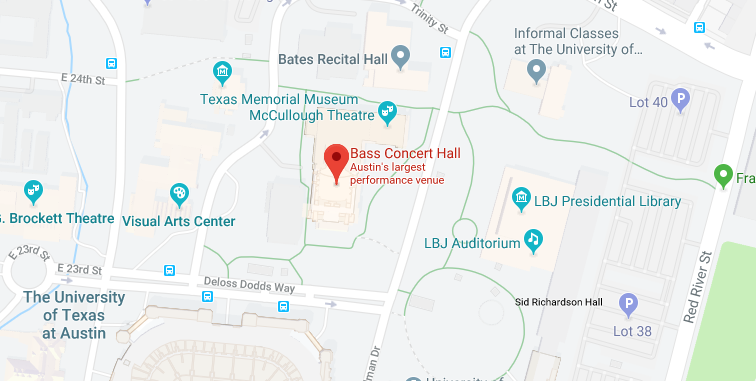 The Bass Concert Hall Ticket Office is open Tuesday – Friday, 10am-6pm and is located at Deloss Dods Way & Robert Dedman Drive, just north of the Darrell K. Royal-Texas Memorial Stadium on the UT Campus. The Ticket Office opens an hour and a half before performances at Bass Concert Hall. For evening weekend performances, the Ticket Office will open at noon. For weekend performances at 1 pm or earlier, the Ticket Office will open an hour and a half before the performance. For the safety of our patrons, security measures have been instituted at all Texas Performing Arts venues. We strongly encourage guests to only bring essential items in order to provide a safer environment and expedite guest entry into the venues. American Sign Language interpreted performances are scheduled for the Saturday Matinee performances (see below). Requests can be made by calling the Texas Performing Arts Box Office at 512-471-1444. Requests should be made at least two weeks prior to a performance to make the proper arrangements. Our TTY line is available at 212.307.2166 (Mon-Fri, 9am-5pm). Audio Description brings the theatrical experience to those who are blind or have low vision. Audio Described performances are provided by Broadway in Austin upon request, and are usually scheduled for the Thursday evening performance of one-week engagements (Tuesday – Sunday Evening). Requests can be made by calling the Texas Performing Arts Box Office at 512-471-1444. Requests should be made least two weeks prior to a performance to make the proper arrangements. Services are not guaranteed for all events and are subject to the availability of an interpreter. For multi-week engagements, or for engagements that do not have a Thursday evening performance, please contact the Texas Performing Arts Box Office. Assistive Listening Devices amplify and clarify sound and are available at all performances. Infrared assistive listening systems are installed in the theater and headsets may be used at any seat. Assistive Listening System headsets are available on a first-come, first-served basis. Patrons may inquire about these devices at Guest Services in the lobby. A photo ID must be given in exchange for an Assisted Listening Device, and will be returned at the end of the performance once the device is brought back. If there are any specific questions, please contact Texas Performing Arts Front of House at 512-471-2787. Accessible Seating for wheelchair and limited mobility needs are available on all levels of the theatre. Please specify your need for this seating when purchasing tickets. Patrons can purchase these tickets online at www.TexasPerformingArts.org or www.BroadwayInAustin.com by selecting the “ADA Seating” filter on the seat map, calling 512-471-1444, or by visiting the Bass Concert Hall Box Office in person during regular business hours. If you need assistance while in the theatre, please find the closest volunteer usher or see someone at the Box Office. Accessible Parking is available at Bass Concert Hall for drivers who have Department of Public Safety handicapped parking permits or plates in the Manor and San Jacinto parking garages. Accessible parking is also available on Robert Dedman Drive, in the Special Accommodation parking spaces which are operated by parking meters and attendants and cannot be purchased in advance. The University requires all faculty, staff, students, and visitors to pay for parking on campus. All parking requires a permit or payment of event parking fees, including the accessible parking on Robert Dedman Drive. Patron drop off can be accommodated on Robert Dedman Drive, or in the Valet area. Broadway in Austin encourages guests to arrive early in order to fine parking. Event parking takes effect 3 hours prior to performance at Bass Concert Hall. Free parking is not available on The University of Texas campus. Guests may pre-purchase parking online before 10pm the day prior to their event using Click and Park. Day of event parking is available for purchase in person at the entrances to campus surface lot 39 and 37 as well as the San Jacinto and Manor garages. More information can be found here. Valet parking ($28) is available and is located directly in front of Bass Concert Hall.